Mattel hates us. If for nothing else, SDCC '03 proved this. But despite my own... very specific feelings and views on how Mattel (mis)handled their Con exclusives, I will try to avert my attention from that aspect and focus on this figure itself. Silver Age Batman. Mattel will never produce a better Batman action figure. Where to begin? The figure comes in a black rectangular box (8.25"x6.5"x2.75"). The only marking on it is a large white version of the Batman line logo and a little white Mattel symbol. One then busts that open to not find a play-ready toy, but instead a second package, this a window box containing the figure. Now, what's the purpose of two boxes? I don't know, but there must be something valid to it because even Palisades' exclusive was in an outer box. The card stock seems to have a reflective, iridescent layer on it, below the color, giving a cool shimmering effect for the art on the back of the box and a silly 1990s display around Bats. This figure is little more than a simple repaint of the highly anticipated (but somewhat under-whelming) Zipline Batman figure from Mattel's new Batman toy line. There are 10 simple points of articulation: T-crotch, knee joints, peg joints at the gloves, waist and base of the skull as well as ball-jointed shoulders. Mattel seems to have it in their heads that anything more than that poses serious safety hazards to children across the globe. I'm sure that's why ToyBiz barely squeaks by with at least 20 on almost all of their figures, but whatever, Mattel knows best... *sigh* The shoulders work nicely, but could definitely benefit from some elbow and/or bicep articulation. Ankle articulation would also be greatly appreciated. A particularly nice touch is the two-part cape. The part up around the neck and shoulders is sculpted plastic, which ends around the base of the shoulder blades and becomes fabric. It's a tasteful and clever way of successfully combining the aesthetics of sculpted plastic and the playability of cloth capes. Also, the gloves are cast in rubber, so it's pretty easy to get the accessories in and out of his hands. The sculpt is really strong too. It's done by Eric Treadaway of the Four Horseman design group and is, daresay, elegantly simple; the proportion and musculature are very good. However, on the regular Batman figure, the detail seems almost lackluster - a problem solved in this Con Exclusive. The first thing that strikes one when looking at this figure is the impressive detail, yet it is in almost no way different from Zipline Batman. The twist here is that the figure has a gorgeous wash (dark grey on the body and blue on the cape) that highlights the musculature of the Bat and makes for a stunning appearance. It's almost funny because just a little bit of paint really changes the quality of the sculpt (even Mattel's other exclusive, Keldor, benefits from a wash, though his is much more hasty and tasteless), and it really goes to show that washes and highlights should be a legal requirement when dealing with a Four Horsemen sculpt. Alas, God knows Mattel is such a struggling company that it couldn't even tolerate the notion of redirecting a fraction of cent away from the standard $8.99 MSRP their figures carry towards actually making the figures desirable, but alas, I said I won't go there and there I shan't go. 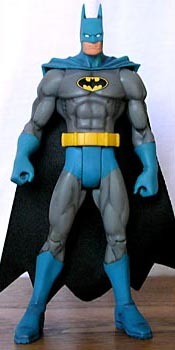 Batman is given the classic yellow and black chest logo (as opposed to the modern all-black one) and has even been given a new, Silver Age-accurate belt! While some might read sarcasm into that last sentence, none is intended because I am quite impressed that Mattel would actually spend money on a new tool for a $20 con exclusive (sorry! More Mattel griping, I'll try and work on that). Besides the new belt, this guy even comes with three scaled down accessories from the upcoming 12-inch Deluxe Batman: a Batarang, Bat-cuffs and a grapple launcher. They're made out of cheap, bendy black plastic but still much more appreciated than an ice shield or water cannon. 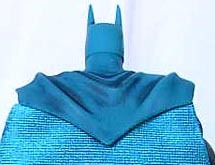 Yet another neat touch is the fabric cape's double-layered look with blue on the outside and black within. All this adds up to what is actually a pretty cool figure, one that is much more so than the Zip-Line figure. In fact, all Mattel-bashing aside, this figure really rocks and has only two problems: the more nit-picky one is that there is some weird blue splotches on the inside base of the bat-ears; I assume they're there to add detail, but they don't really work very well - admittedly, a minor gripe. Secondly, there is no paint on the belt; while under other circumstances I wouldn't mind so much, it sticks out like a sore thumb here, sandwiched between the two halves of a paint-washed figure. The wash I simply can not say enough about; it is a thing of beauty that does nothing but accentuate the sculpt. It is really a shame that the other Batman, and even He-Man, figures lack such a simple trick that really multiples the coolness of the product. But cool as it is, I wouldn't go as far as to say it was $20 cool. Just saying that, accepting the fact that I paid twenty bucks for this... it depresses me quite honestly. This figure is little more than a simple repaint and there is no excuse whatsoever for this to cost that much. Case in point, Art Asylum (a much smaller company than Mattel, with way fewer resources) was able to put out their Captain Kirk exclusive (which has more articulation and accessories) at the same edition size, 3,000, for $5 cheaper. I look at this Silver Age Batman and feel like a sucker. 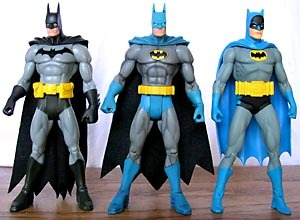 But, I suppose that at the end of the day I have the only Batman figure Mattel will probably ever release that is as cool as the character and as beautiful as the fans deserve, and that is a very bittersweet notion. 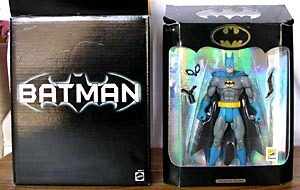 There is just no reason for this not to be in the hands of every Batman fan and collector out there today. But alas, we are dealing with Mattel; a company that says is listening, but hears only the 5-year-olds in their focus groups. Silver Age Batman is a darn fine figure with an exceptional paint job that cannot be recommended enough. Yet it is also a victim of a company that doesn't care and that certainly didn't make this figure nearly as available as it should have. Do you know what the phrase "getting Matteled" means? Tell us on our message board, the Loafing Lounge.